Clean pomfret and fillet the meat. Cut the fish fillets into slices. Add a little of the seasoning to the fish and fish slices. Sprinkle the tapioca flour over the fish and fish slices, and coat them well with flour. Heat enough oil for deep frying, and deep-fry the fish and fish slices until golden and crispy. Remove the fish onto a serving platter and pile the fish slices on top. Leave one tablespoon of oil in the wok. Sauté the ginger until fragrant and add the pineapple. Fry for 10 to 20 seconds. Pour 120ml of the lychee syrup in and bring to boil. Add remaining seasoning ingredients and bring to a quick boil. Add the lychee and stir to combine. 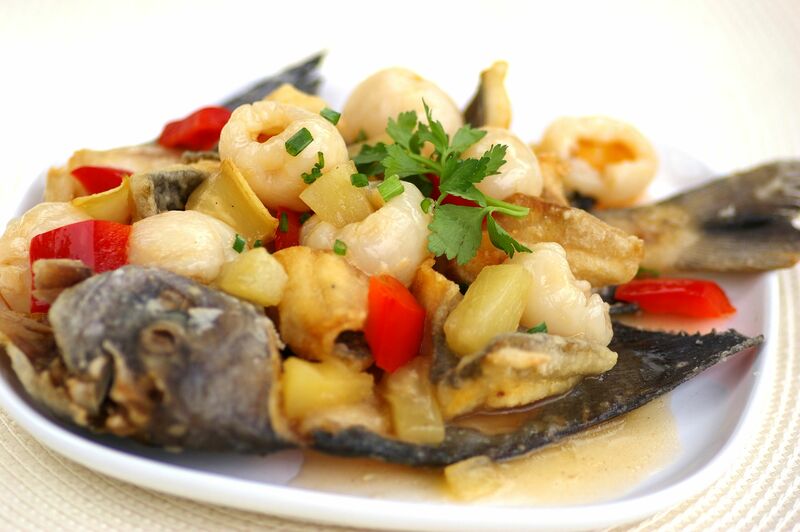 Pour the lychee and sauce over the fish, garnish and serve immediately. We are still fine-tuning the search function. We apologise for any inconveniences caused.There is actually more results when you do a search. You may see only a few but at the bottom left corner of that result, you will see More Items. Click on it and you will get more results.